In A Dark Time Research Papers discuss a poem by Theodore Roethke about a man that veers on the edge of sanity through an outdoor experience. 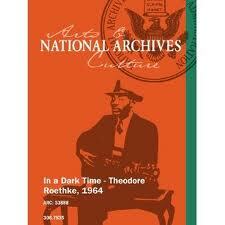 In a Dark Time research papers examine the poem by Theodore Roethke and explicate its meaning. Paper Masters has writers that possess master's degrees in English Literature and write all our research papers on poetry and poets like Roethke. His 1964 poem “In A Dark Time” is both disturbing and challenging as a man veers on the edge of sanity through an outdoor experience. Roethke demonstrates through subject and form that he is a master poet, reflecting the deep inner sense of self that can portray such emotions without being reduced to cliché or juvenilia. The title of the poem—“In A Dark Time”—is the first clue that all is not well in Roethke’s universe. It is the primary indicator that the poem speaks to the troubled half of life. In many ways one is reminded of Robert Frost’s “Acquainted With the Night,” which conveys a deeper metaphor of depression in its surface-simple account of insomnia, the poem's theme. “In A Dark Time” speaks volumes about the poem that will follow, setting up the plot. Roethke relies on a single simile in this poem, although it is replete with metaphor. In the last stanza, he says his soul is “like some heat-maddened summer fly” buzzing on the windowsill. One can instantly picture the frantic action of such a fly, its nervous bouncing, ticking and constant action. His soul, being like this, is perpetually agitated. But Roethke has established this interpretation through the metaphor of the dark woods; a place where is soul has been caught out in the middle of the day, yet plunged in darkness. He is lost here, wondering whether something ahead is shelter (the cave) or further travail (merely a bend in the path). He sees himself dancing on the edge physically and metaphorically. In the first two stanzas, Roethke personifies his shadow, an image that most people perceive as a dark figure to begin with. Roethke expands the idea of his shadow to incorporate the darker nature of his self. He meets his shadow in the deepening shade, giving the reader a sense that he is meeting the darkest part of his inner self at a time when the depths of his depression have encompassed him. As with most people, Roethke relates a realistic happening as most people only reflect upon their lives in their darkest hours (“In a dark time, the eye begins to see”). In the last stanza, Roethke personifies his fear. (“A fallen man, I climb out of my fear”). As many know, fear is not a physical entity that can be ascended or descended. In this case, however, Roethke’s fear (“his dark time”) has become such an overwhelming reality to him that, in order to emerge from the depths of his struggle, Roethke sees this ascent as a physical act. Reading the line in full, the reader gets a sense that Roethke has actually fallen into an abyss known as fear. Types of Depression research papers discuss the differences between clinical depression and manic depression. Order a research paper on Depression from Paper Masters. Paper Masters writes custom research papers on In A Dark Time and discuss a poem by Theodore Roethke about a man that veers on the edge of sanity through an outdoor experience.